Accepting the recommendation of the Justice (Retd.) Ranjit Singh Commission, Punjab Chief Minister Captain Amarinder Singh on Monday announced his government’s decision to hand over the probe into Kotkapura and Behbal Kalan firing that followed the Bargari sacrilege to the Central Bureau of Investigation (CBI).The Chief Minister also announced compensation and jobs for the victims/families of the police firing at Kotkapura and Behbal Kalan that took place on October 14, 2015. The government, he further said, had decided to enhance the compensation amount from that recommended by the Commission, whose report was legally examined by Advocate General Atul Nanda before being considered by the government.Addressing a press conference here, the Chief Minister said the decision to hand over to CBI further probe into the matter against all those implicated by the Commission had been taken to ensure an impartial and objective investigation after registering a case under Section 307 IPC. The role of all the police officers named by the Commission will be probed by the CBI and all documents related to the incidents will be handed over to the agency, said the Chief Minister. Very senior officers could be involved so it was felt that the matter was best investigated by the CBI, he added.It may be recalled that the CBI is already probing certain other cases of sacrilege of Holy Sri Guru Granth Sahib ji, which were handed over to the central agency by the state government earlier. The Commission of Enquiry headed by Justice (Retd.) Ranjit Singh submitted its first (part-I) report on 30th June 2018. Though the full report is awaited, the Government has decided to accept the recommendations made by the Commission so far, said Captain Amarinder Singh.The report of the Commission would be laid on the floor of the Punjab Vidhan Sabha in its next session after the Commission completes its proceedings. Responding to a query, the Chief Minister said a special session of the House will be called only the government receives the full report since action taken report cannot be tabled on a partial report.The complete report, running into 182 pages with thousands of pages of evidence, will be in four parts and all four would be tabled in the House with the action taken report, he said.In the first part, the Commission has covered incidents of sacrilege of holy Sri Guru Granth Sahib Ji at villages Burj Jawahar Singh Wala, Bargari, Gurusar and Mallke on and around 01.06.2015, 25.09.2015, 11.10.2015 and 12.10.2015; and police action involving firing at Kotkapura and Behbal Kalan on 14.10.2015, leading to death of two persons and injuries to some other persons. 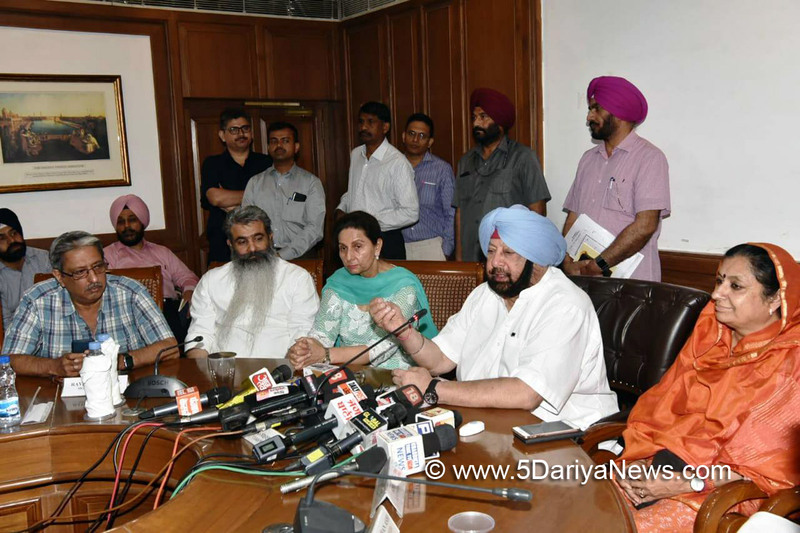 Captain Amarinder Singh told mediapersons that the government had agreed outright to the Commission’s recommendations to provide monetary compensation and jobs to the affected persons. The government has, however, raised the compensation amount for the families of the two deceased from Rs.75 lakhs as recommended by the Commission to Rs.1 crore each, whereas the compensation for the seriously injured S. Beant Singh has been raised from Rs.35 lakh as recommended by the Commission, to Rs.50 lakh. A member of each of their families would also be offered a job in the Government, said the Chief Minister. Further, the compensation for S. Ajit Singh, who has been incapacitated for life, has been raised from Rs. 40 lakh to Rs.60 lakh. He would also be provided an attendant and reimbursement of medical expenses, the Chief Minister disclosed.All other injured in the firing incidents would be given Rs.10 lakh each, Captain Amarinder Singh announced, adding that the government had decided on these measures as part of its efforts to instil a sense of justice in the general public, though it could not, unfortunately, bring back the people who had lost their lives.The Chief Minister said the Commission, in its 1st report, has recommended appropriate action against the then SDM Kotkapura and those police officials who, though not apparently guilty of any criminal act, were nevertheless seen to be responsible for police action. A number of police officers have been found liable for failing to carry out proper and fair investigations of incidents of sacrilege and in the cases which were registered regarding use of force at Kotkapura and Behbal Kalan. The Commission has recommended appropriate action in accordance with law against all such officials. The Commission has, in particular, mentioned the role of Inspector Pardip Singh, SI Arriarjit Singh, and SP Bikramjit Singh and recommended them to be named as accused in FIR No. 130 Police Station Baja Khanna and their role be thoroughly investigated which has not happened so far. The role of the then SSP Moga Charanjit Singh Sharma has also been cited in this context and the Commission has recommended that his role, and that of Constable Shamsher Singh, Constable Harpreet Singh, Constable Gurpreet Singh and Constable Parminder Singh, as also of Inspector Harpal Singh SHO Ladowal, be thoroughly investigated as they were carrying assault rifles at Behbal Kalan.The role of the Commando Police for use of indiscriminate lathi-charge, causing injuries to number of persons, has also been recommended to be investigated, which has not been done till date. The Captain Amarinder Singh government had set up the Justice (Retd.) Ranjit Singh Commission in April last year to investigate the incidents of sacrilege of holy Guru Granth Sahib and other religious texts. The government had rejected the findings of the Zora Singh Commission set up by Akali Dal government, saying its findings had been “inconclusive.”Prominent amongst others who were present on the occasion included Cabinet Ministers Tript Rajinder Singh Bajwa, Aruna Chaudhary and Bharat Bhushan Ashu, Former Minister of State for External Affairs Maharani Preneet Kaur, AICC Punjab Incharge Asha Kumari, Senior Advisor to CM Lt. Gen. (Retd.) TS Shergill, Media Advisor to CM Raveen Thukral, Advocate General Atul Nanda, Special Principal Secretary to CM Gurkirat Kirpal Singh, Additional Chief Secretary (Home) NS Kalsi and Secretary Home Kumar Rahul.